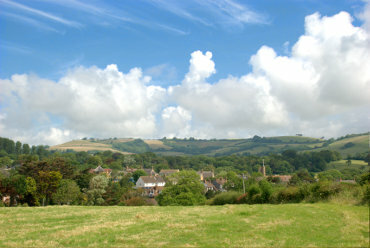 Chideock is a small village nestling in among the surrounding hills. It is on the road from Lyme Regis to Bridport and there is a bus service between those places. This view is taken from along Sea Hill Lane looking north. 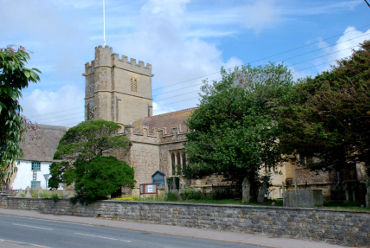 Chideock is pronounced 'Chidock' (no "e") and is recorded in the Domesday Book in 1086. St. Giles Church dates from the 12th century although there have been many modifications over the centuries. The oldest part of the church is the Norman Nave. The North Transept was added in the 14th century, there were more additions in the 15th century and the Victorians restored it around 1884. 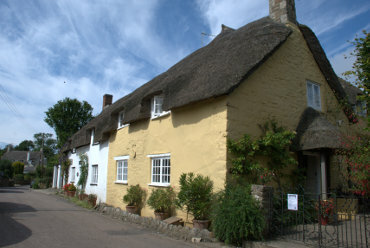 There are a number of thatched buildings in Chideock of which these thatched cottages in Sea Hill Lane are just a few. Sea Hill Lane runs from near the Church in Chideock to Seatown on the coast and makes a pleasant easy walk. Walking from Chideock along Sea Hill Lane for a little over a half mile brings us to Seatown. In spite of the word 'town' in its name there is barely a handful of properties here; one of which is the Anchor Inn. 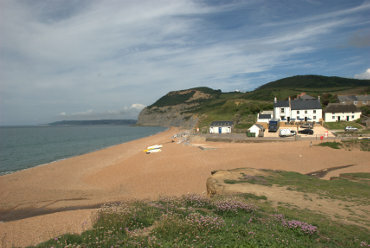 The large hill next to the sea further along the coast is Golden Cap; the highest point on the South Coast. Walking from Seatown back along Sea Hill Lane for a short way gives access to the path up Golden Cap. 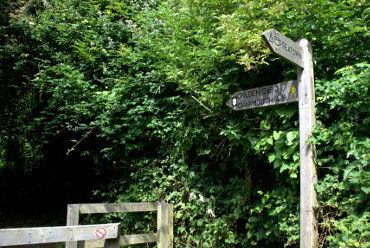 The distances given on the signpost are 1.25 miles to the top of Golden Cap and 4.25 miles to Charmouth. The route is well marked but you would be advised to carry a map.